AR Temperature Control Temperature control for any electrically heated solid, liquid or gas, single phase 120 to 480 V, 30 amp. Temperature ranges from 0-100F, 60-250F, 200 550F, 300-700F. ARLT Temperature Control Weather Resistant temperature control for any electrically heated solid, liquid or gas, single phase 120 to 480 V, 30 amp. Temperature ranges from 0-100F, 60-250F, 200 550F, 300-700F. AREP Temperature Control Explosion Resistant temperature control for any electrically heated solid, liquid or gas, single phase 120 to 480 V, 30 amp. Temperature ranges from 0-100F, 60-250F, 200 550F, 300-700F. ARC Limit Control When properly applied, the ARC protects against damage due to product or heater overheating by opening a circuit when a preset temperature is reached. 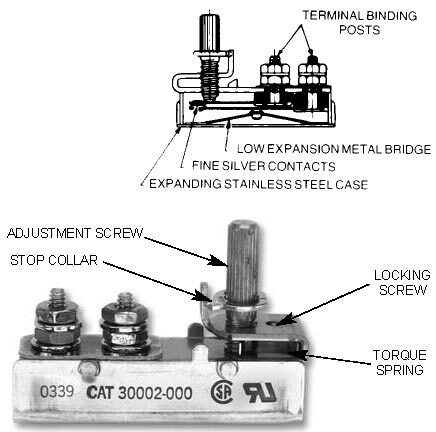 Manual reset button provides for manual restoration of process circuit when overheat condition is corrected. Neon pilot light glows when cutout is reclosed. Pilot light and knob cover are furnished. TB-250N All-Purpose Thermostat Great all-purpose temperature controller good for most of your industrial applications. Manually set your desired temperature. Choose between three separate temperature ranges, average Precision of ±5°F (3°C), up to 277 VAC, 22 Amp capacity, outdoor NEMA 3R enclosure, 100 ft. copper capillary sensor. 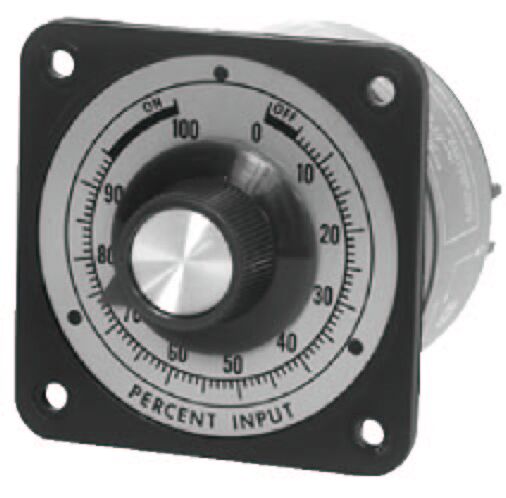 TB-110N Hazardous Area Thermostat Functions just like the all-purpose temperature controller. Choose between two separate temperature ranges, average precision of ±5°F (3°C), up to 480 VAC, 22 Amp capacity, explosion resistant (NEMA 7 and 9) and outdoor rated. 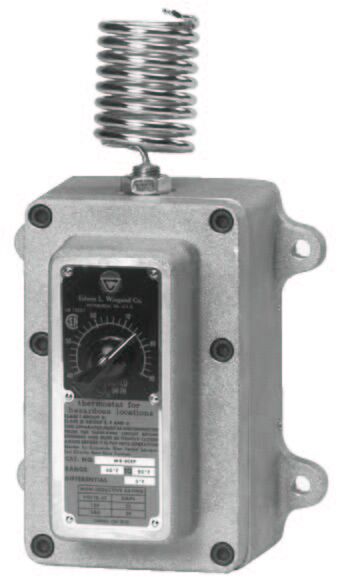 T1A / T1B Temperature Control Non-Indicating single pole, single throw mechanical thermostat, 60º-250º F Temperature Range, +/-4% differential, 25 amps, 4 Foot Teflon-covered capillary & bulb, pilot light standard, durable moisture-resistant case. 40º-104ºF also available, specify T1A when ordering. T1JA / T1JB Temperature Control Non-Indicating single pole, single throw electronic thermostat, 50º-250º F Temperature Range, 20 amps. 10 Foot Teflon-covered type “J” thermocouple, durable moisture-resistant case, 0º-100º F also available, specify T1JA when ordering. 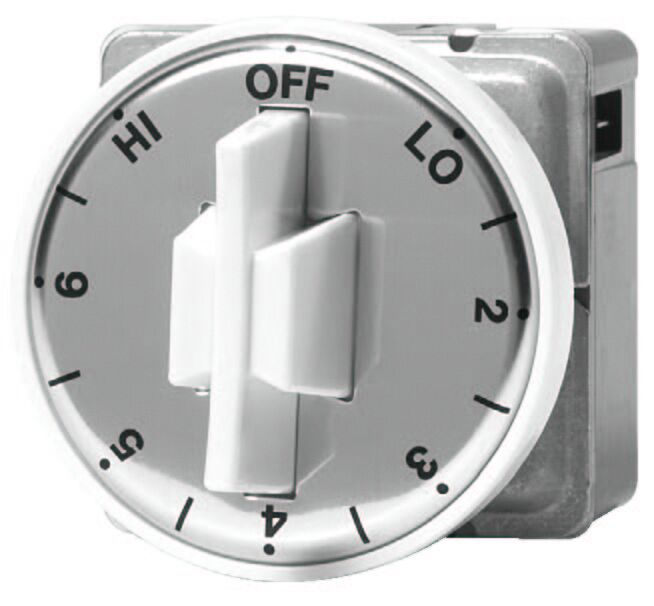 T2A / T2AL / T2B Temperature Control Non-Indicating double pole, single throw thermostat. 60º-250º F Temperature Range, +1-4% differential 25 amps, 5 Foot Teflon-covered capillary & bulb, sensing bulb 1/4” diameter x 9 1/2” long, durable moisture-resistant case, 0º-100º F (type T2AL) & 175°-550°F (type T2B) also available. 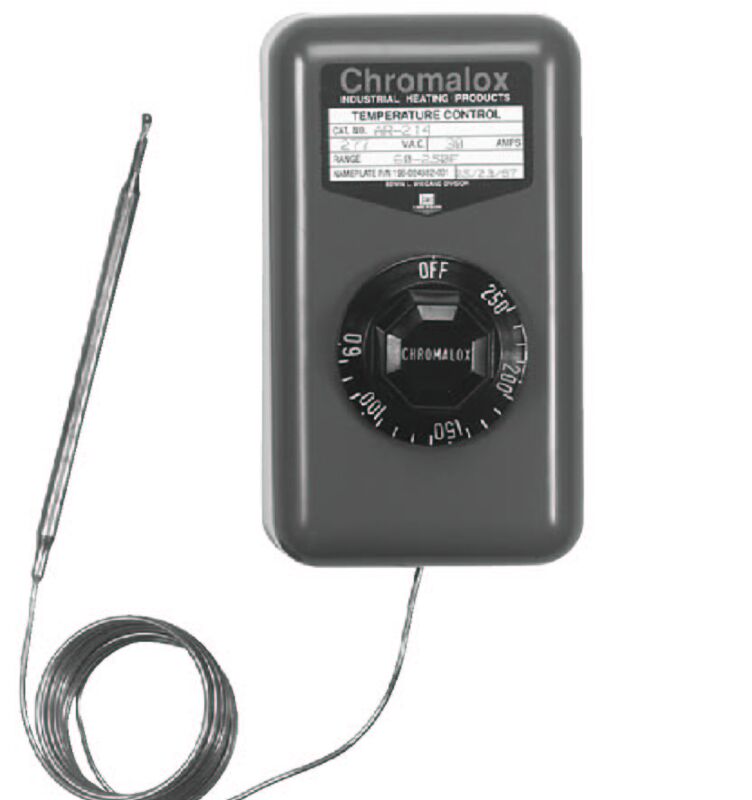 T1RB-LCD Temperature Control Indicating single pole/ single throw electronic thermostat, 50º-250º F Temperature Range, +/-2% differential, 20 amps, 4 Foot Teflon-covered platinum RTD sensor, LCD readout display, durable moisture-resistant case, longer 6 foot sensor probe available-specify when ordering. GRT Raintight / Explosion Resistant Control Thermostat for outdoor and hazardous locations, temperature ranges from 0 to 150F to 325 to 475F, see more models below. 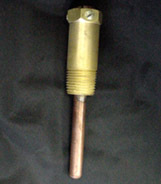 WEL Thermowell for GRT Bulb Sensor Brass and copper thermowell for the GRT bulb sensor. 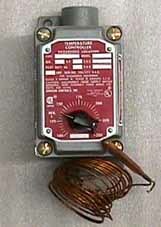 GT General Purpose Temperature Control Heavy duty, general use thermostat rated to 25A and 277 VAC. Typical applications include ovens, water baths, and molding machines. Temperature ranges form 0-150F, and 150-550F. CH Infinite Control The CH gives infinite control for noninductive loads up to 15 Amps on 120 or 240 Vac (cannot be used with external contactor). It can be turned either to left or right to select proper heat from 0-100% wattage with infinite control over the first 50% of total wattage. Energized continuously in HI position, at other settings it delivers selected input level under control of a simple bimetal timer. VCR / VCS Percentage Timer Control Percentage timing can be set to energize a heater for a chosen percentage (4-100%) of a preset 15 or 30 second cycle, thus derating heat output to match varying work sizes, loads or conveyor speeds. Settings are repeatable between instruments and provide constant percentage of heat output, 120 or 240V. WR-80 Temperature Control The WR Series Room Thermostats are designed to directly control individual heaters or, by using an external contactor, can control several heaters. The WR-90 is particularly useful for maintaining lower temperatures (in garages, warehouses, etc.) and avoiding unnecessary heating costs. Each design has accuracy and provides long reliable service with a 3 degree control differential. Both units are heavy duty, single stage, with a SPST line voltage snap-action switch and are finished with tough, metallic gray enamel housings. WR-90 Temperature Control The WR Series Room Thermostats are designed to directly control individual heaters or, by using an external contactor, can control several heaters. The WR-90 is particularly useful for maintaining lower temperatures (in garages, warehouses, etc.) and avoiding unnecessary heating costs. Each design has accuracy and provides long reliable service with a 3 degree control differential. Both units are heavy duty, single stage, with a SPST line voltage snap-action switch and are finished with tough, metallic gray enamel housings. WR-80EP Hazardous Area Temperature Control The WR80-EP Room Thermostat is designed to control individual heaters directly or by using an external contactor can control several heaters. It is suitable for Class I, Division I, Group D and Class II, Division I, Groups E, F and G locations. The control is a heavy duty, single stage, SPST line voltage snap-action switch. 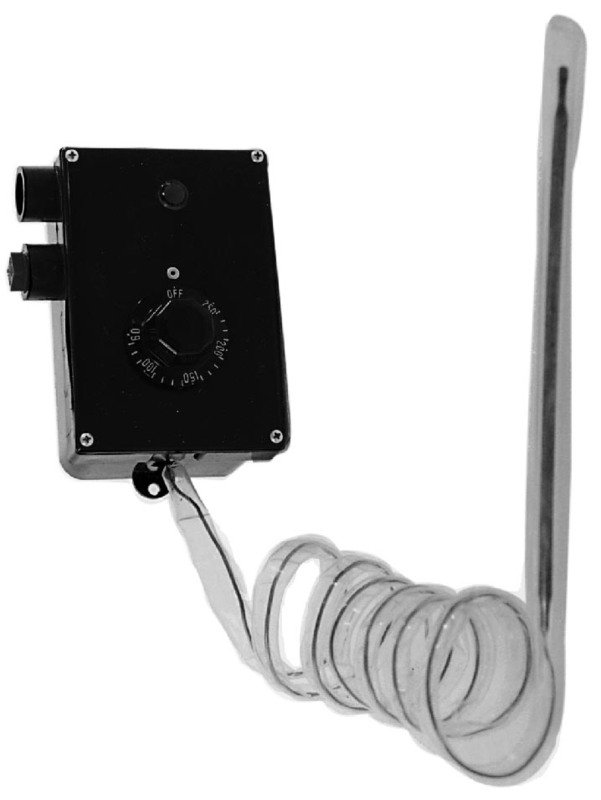 It features an external, coiled sensing element and adjust- able setpoint knob. 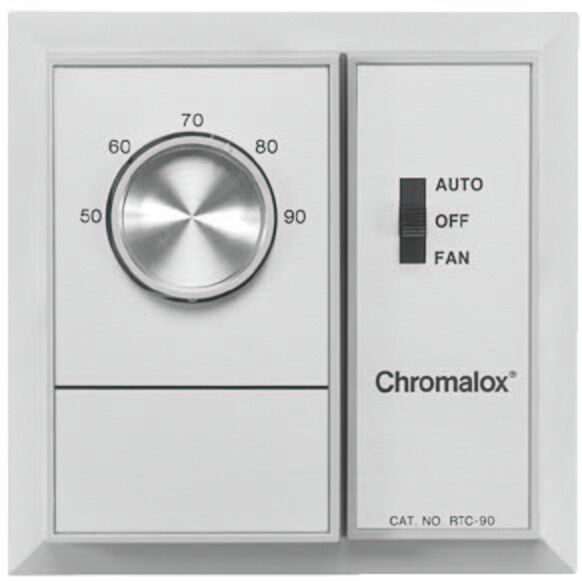 WCRT Temperature Control WCRT Room Thermostat is designed to directly control an individual heater. Using an external contactor, it can control several heaters. 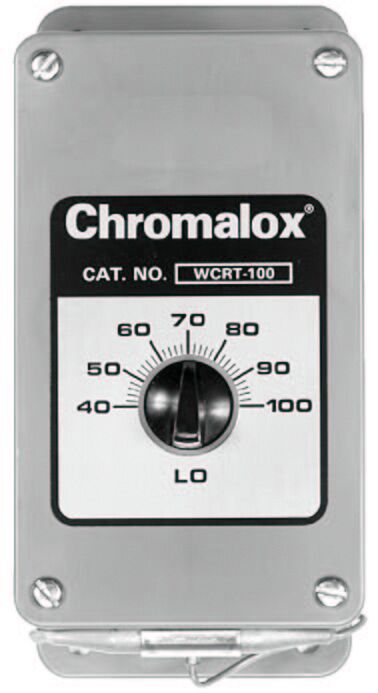 The WCRT provides high level accuracy and sensitivity with 2.5F differential. The control has a SPDT output and can be used for heating or cooling, 25 amps 120-240V. RTC Temperature Control The RTC Room Thermostat is designed to control heaters directly and will accommodate heating and ventilating equipment within the voltage and current capability of the contacts. The RTC can also be used to control valves, relays, auxiliary electric heaters and fans associated with fan coil units, and has a fan- only switch. In most applications, it can switch loads directly without the use of external relays, but an external relay can be used for larger loads. 30000 Series Surface Mount Control Fully adjustable, narrow temperature differential, compact size, economical, Overlapping ranges from 50° to 600°F (10° to 315°C), 1200 Watt resistive load at 120/240 VAC. SA Series Surface Mount Control Fully adjustable via knob or setscrew, mounts firmly to heated surface, temperature differential of approximately 5 to 20F depending on rate of temperature change, location, mounting, etc, 12 amps on 120V, 6 amps on 240V. 17000 Series Temperature Control THERMOSWITCH ® controllers operate on the principal of differential expansion of metals providing fast response and extreme sensitivity for precise control. With surface mount designs the stainless steel outer case of the controller expands at a greater rate than that of the internal bridge assembly allowing temperature changes to be sensed instantaneously. -100 to as high as 1100F models available. 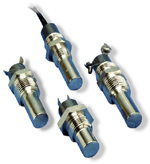 20000 Series Temperature Control snap action liquid filled controllers, the expandable liquid surrounding the bellows is in direct contact with the temperature sensing outer shell providing a fast response for accurate temperature sensing. These controllers are available with a single circuit or dual circuit that can be set at any temperature within the controller's range. On dual circuit units, each switch may be set individually, allowing independent action. 0-300F, 15 amps 240V maximum. 08 Series Snap-Disc Control Bimetal thermostats are available as surface mount or probe type with factory pre-set actuation temperatures of 10 ° F to 550 ° F. Narrow temperature differentials and tolerances and a wide range of mounting & termination configurations are available to meet specific design requirements. 120 to 240V, 12 amps. 08 Series Snap-Disc Probe Control Probe type thermostat is designed for direct insertion into the medium being sensed. The bimetal disc is enclosed in the tip of the probe to provide fast thermal response and rapid, positive contact action at the preset temperature. Narrow temperature differentials and tolerances and a wide range of mounting & termination configurations are available to meet specific design requirements. 120 to 240V, 12 amps. 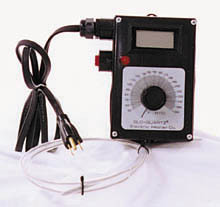 Detect-A-Fire Spot Detection DETECT-A-FIRE units are designed with RATE COMPENSATION. 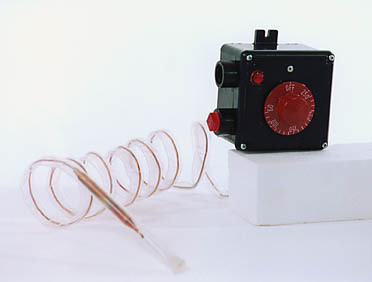 This provides a unique advantage over both fixed temperature and rate-of-rise types of detectors because only the DETECT-A-FIRE unit accurately senses the surrounding air temperature regardless of the fire growth rate.Two models availabe with preset temperature ranges. CFD Linear Detection Continuous Fire Detection System stands alone in its field with the unique ability to detect specific overheat conditions at any point along the entire length of its sensing element run without regard for rate of temperature rise or average ambient temperature. Made to order lengths with preset temperature ranges.